One of the most vexing things about adding turbochargers to your car is determining where to place them, how to make them fit, and how to get the plumbing right in your engine bay. Budget minded solutions have included flipping headers over backwards to move the exhaust flow toward the front of the car and then hack and modify stuff off of that idea to make it work. This is effective but it is far from hassle-free and that’s why Flowtech saw the need to make something to advance the cause of anyone looking to make the turbocharger move. These headers are one example of their approach. The down and forward style headers have beefy thick flanges with the understanding that there’s going to be turbochargers hanging on the ends of them. 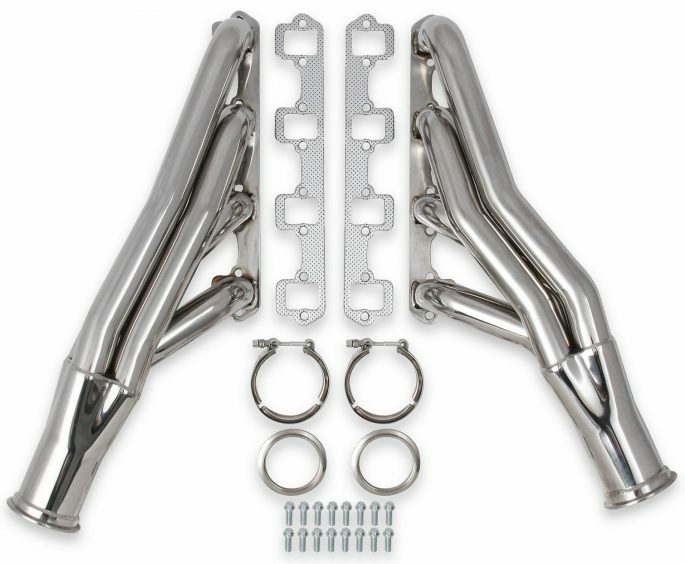 The headers can be had in coated miles steel, natural 304 stainless and polished 304 stainless. They are not bank breakers either. The stainless examples can be had for little more than $200! The headers come complete with V-band clamps and all. This is the right way. Dooooo it! Click the image below to learn more about the whole Flowtech turbo header line!